The details of the wall design that I use. The top level building science on wall design is covered on the previous pages, but it's worth talking about some of the details my particular wall design. You can see my wall design and how it dries in the diagram below. The vapor barrier is part way through the insulation. Neither side of it is a particularly cold surface, so this reduces the likelihood of condensation. 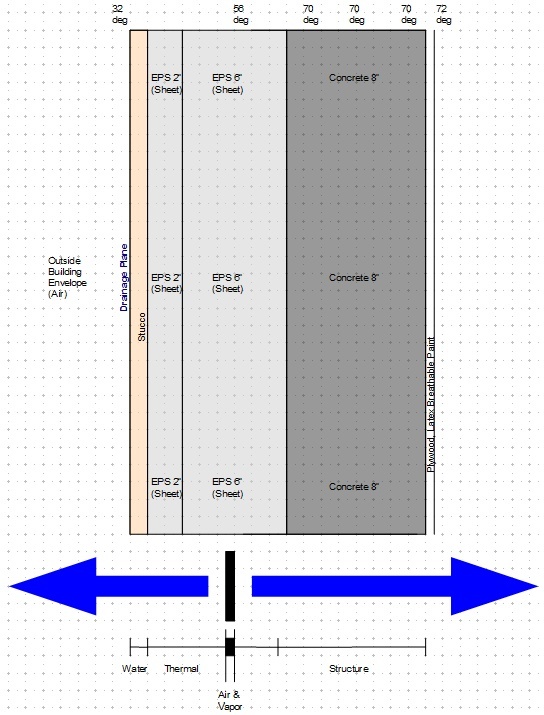 In practice, because EPS in sufficient thickness will stop most of the water vapor, it is ok to leave off the actual polyethylene vapor barrier when the wall is above ground, but it is still good to assume a virtual vapor barrier in the place shown in the diagram. A drainage plane is the first in line defense against rain water. You want the majority of the rain water to run away rather than soak into the wall. It does not matter much if it does soak in as it won't get through the distributed vapor barrier, and it will easily dry (to the outside), but even so, if it's easy to make it drain straight away then this is goodness. The primary drainage plane in my wall design is the outer stucco surface. To further increase the water shedding ability, you can paint on a water repellant product. You are best using a transparent water repellant sealant that soaks in. A soak in water repellant can be found here . In the Building Science paper that can be found here there are 3 strategies for keeping rain from penetrating walls. The classifications are "Perfect barriers", "Mass or storage systems", and thirdly "Screened and drained walls ". In the definitions of wall types presented in the paper, my wall is a "perfect barrier" design with that "perfect barrier" being the outside layer of stucco. As a backup strategy it also provides an inner "perfect barrier" which is the distributed water barrier in case the external "perfect barrier" ever becomes slightly imperfect. Note that "perfect barrier" designs do not require a drainage air gap inside the wall. The concrete in the wall is 8 inches thick (12" in some places), but concrete is primarily a thermal conductor rather than a thermal insulator. What's more, the concrete will be heated by the house central heating system so its temperature will be fairly close to the temperature inside the house. Even though concrete is not a thermal insulator it does have beneficial effects in that it is a huge thermal mass. A thermal mass that is closely connected to your inside living space will help you keep cool in the summer by releasing the cool of the night during a hot sunny day and will help keep you warm on winter nights. If you have been out of the house visiting friends or relatives for a week over the winter holidays and then as soon as you come home you start boiling pasta and soaking in a hot steamy bath then you will get condensation on your inside walls. The reason of course is that without the heating on in the house while you were away, the concrete in the walls will have cooled down to the outside winter air temperature. It will take quite a few hours to heat up the walls, even if you turn your heating up full blast, because of the thermal mass. If hot air, that's laden with lots of water vapor from your bath or kitchen, hits the cold surface of the wall then you will get condensation. Even if you don't mitigate this extreme example by turning on your heating with a timer or over the internet a few hours before you get home, with a proper water vapor wall design it is not really much of a problem. Any water that does collect in the wall will quickly dry out after the concrete comes up to temperature. I don't plan to bother with air conditioning because the thermal mass of the concrete will keep the house cool on hot summer days, but if I did decide to install air conditioning, the wall would function perfectly well in a reversed condition where it was hotter outside than inside the house. This is because the vapor barrier is sandwiched in the middle of the wall with insulation on both sides. This avoids having to make a choice between having the vapor barrier on the inside of the wall (cold northern climates) or the outside (hot southern climates). In Canada it is a building code requirement to have the vapor barrier on the inside surface of the wall. If global warming kicks in and they start having hot days in Canada and buy air conditioners, then their houses will all rot because lots of condensation will form deep inside their walls. Proper flashing is an important part of rain control in a wall design. This is primarily because joints between one material and another can result in a crack that can let water in. The window to wall joint is a primary example that needs special care. You should aim to seal all your joints, but even so, it is still good to divert water away from and past the joints. Flashing does this diverting and also provides a drip edge so that the water can fall cleanly to the ground without running down the outside of the wall looking for susceptible joints.